All dog owners who see a well trained dog look with respect and automatically believe that he/she is a clever dog and wish their own dog was just as clever. The true fact is that with the correct training all dogs find a ay to share their special talents that have been hidden. Dogs are very inteligent creatures much more brighter then one would thinck. Human beings tend to look out at all other inteligent life forms and weigh their inteligence with our own according to our way of thinking and understanding. For this reason many dogs live a life where they are trying to communicate with us but not knowing how niether side get to benefit. A dog who completes an obedience program learns to communicate and finding that it is possible doesn't give up. With proper training instructors will teach in a special manner. This is all to do with understanding and appreciating the way dog's brains work and teaching accordingly. Owners get to see that their dog is performing wonders and is acting how they wanted their pooch to do so. Obedience training is where an owner gets to understand how inteligent their dog really is. This is where true obedience is expected from the trainee. All training programs require obedience else the program will not work. Many pet enthusiasts spend much time with their dogs and enroll for Obedience classes for more fun with their pooch. Obedience is a four stage program. Each stage consists of further commands and prior commands are performed in a harder manner. Not all dogs will have what it takes to complete all stages. Not all owners do either! All dog breeds may enter Obedience classes. Different working dogs can stop at different levels of Obedience. Each program has its minimum requirement but a dog with the required potential is free to climb the ladder however owners must always realize that dogs get rusty and can forget just like us humans. The higher the stage of training attended the more time is required from owners to keep the training up to scratch on completion of the course. The OB course will vary from breed to breed. Only a handful of breeds will get as high as OB3+ and only a handful of each of these breeds will successfully complete the OB3+ program. The minimum entrance age for dogs is 12 moths. Dogs that have attended the FGO program will have had a sufficient time to have improved their training and will be more successful then those that didn't. (Puppy' that attended the FGO program has the FGO program discounted from the OB1 program. Can't get paid for the part already taught…) The OB1 certificate entrance age is generally at a minimum of 18 months of age. 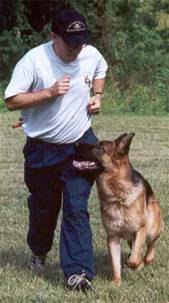 OB1 dogs are expected to heel in crowds, pick up a dumbbell on command and travel over jumps to their handler. Whilst a second dog goes through the course he/she is expected to lie still at the end of the training field. He/she must show no exaggeration on the sound of a pistol. Commands such as sit down, stand, stay, and heel are to be performed in a joyful manner. On inspection no fierce fullness, shyness etc. can be shown. Training can be given by anyone with love, patience, understanding and training knowledge. Training is carried out at the training center by or with instructor. The course can however be given at home but we do not highly advice it. K-9 trainees have to continue this program at the training site where they will be accommodated. Training takes between 10 to 30 days. Youngest attendance is of 13 months. However dogs at or older then 18 months of age will generally perform better. Certificates are generally issued earliest at 19 months of age. Clever and successful OB1 attendants generally continue with the OB2 course a month after completing the OB1 course giving plenty of time to improve thus successfully compete for certificates and rank higher. OB2 training is a more complex version of the OB1 training program. Jumping heights are raised and a wall climb ramp is added. A more disciplined and a perfectionist performance of commands are asked for. Extra commands and abilities are carried out. Training is performed at the training center and continues for 15 to 35 days. Training is carried out by or with an instructor. Yet again a harder and more complex version of OB2. OB3 is the competition level of obedience training. OB3 certificate exams are held at earliest 20 moths of age. OB3 training is a hard training cycle that not many trainees and/or owners will be able to successfully complete! Even though proven family line holders of purebred dogs are the ones with a higher chance all that attend will require a decent puppy hood, proper feeding, a good foundation and an upbringing full of love. Improper handling or upbringing of the even the best dogs will result in failure of this program. The OB3 certificate is therefore something one will always be proud off! The OB3 training programs include events such as climbing ladders. Training continues for 20 to 40 days. This is the hardest and highest obedience level that one can reach. Only the best of the best can compete and / or succeed. Training generally starts at the age of 24 months and competition for the title at the earliest age of 36 months. This high level of obedience is rarely required by advanced working dog titles. Even SchHIII dogs only have the necessity of getting up to level 2 in Obedience to compete for the title and even enter competitions. 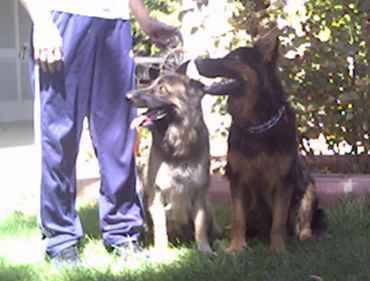 Extreme obedience required duties such as K-9 or Blind Leader dogs require the OB3+ certificate. Training is carried out by instructors at the training center, for a length of 20 to 50 days.